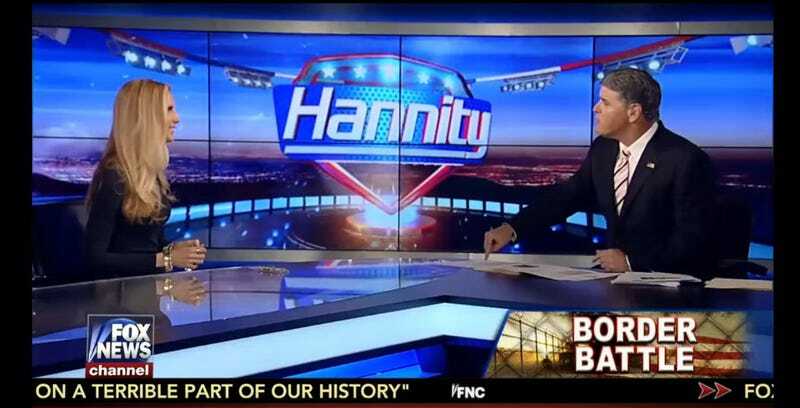 People say they hate it when Mom and Dad fight, but we love it a lot, particularly when mom is peppy Dementor Ann Coulter and dad is enraged football coach pounding the steering wheel and screaming after 20 losing games in a row Sean Hannity. They’re fighting about Marco Rubio, and it’s all so embarrassing, and I just want to make it into a milkshake and drink it forever. As best we can figure, Coulter and Hannity are having a sprawling, bitter, delightfully embarrassing Twitter spat about Marco Rubio and border security. More broadly, it’s about whether Fox News is stooging for Rubio, whether they adequately support the concept of making undocumented people miserable, and whether Hannity is a miserable hypocrite. The “amnesty” she’s referring to is 2013's so-called Gang of Eight bill, a bipartisan effort Rubio was part of that would’ve created a path to citizenship. It failed, obviously, because we can’t get stuff like that done around here, but prior to that, Rubio appeared on Hannity’s program to argue his case before Fox’s audience of racist Crypt Keepers. Hannity was skeptical, but did indeed call it the “most thoughtful” bill he’d seen. Coulter, meanwhile, is a noted Trump fan; she was particularly taken with that time he said Mexican immigrants are rapists. So it’s not surprising she wrote a statement to house organ Breitbart calling Rubio “[John] McCain is [sic] sheep’s clothing,” which I guess is real bad. She’s accusing Hannity of supporting Rubio’s bill, and, by extension, illegal immigrants, a group of whom literally live under Ann’s bed and pop out periodically to scream insults about her life choices. “That would be me,” he wailed. There are lots of things to love here: the way Hannity tweets like your mom texts, all 8th-grade style abbreviations! His inability to use commas or apostrophes correctly! The fact that they keep quoting each other’s tweets instead of replying directly, for some reason! “Love you!” she tweeted, already planning how to shank him with the sharpened leg of a pair of Make America Great Again sunglasses when they run into each other in the halls at CPAC. What dinner? Who’s got an ax? Oh my god, why would anybody give Sean Hannity an ax? This has been going on for a generous 24 hours now, it shows no signs of abating, and goddamn, are we savoring every stupid morsel. Hannity is pledging to address the “lying New York Times” story today on his radio show. Wonderful.